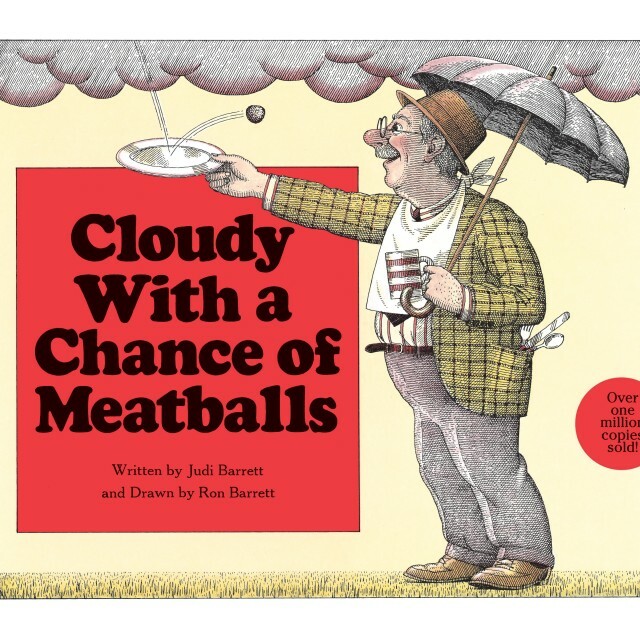 Cloudy With a Chance of Meatballs by Judi Barrett; illustrated by Ronald Barrett. My Grandpa bought me this book when I was a kid and I was fascinated with it on so many levels. I brought it home from the library for my own kid this week. I’m not sure if he will obsess over it the way I did, but he definitely loves it. Apparently a movie of this book was released a few years ago…I’m just going to pretend that never happened and keep my memories preserved in the print version. If you haven’t read this before, I’ll give you a quick synopsis. One morning Grandpa comes over and makes pancakes for the kids. A mishap leads to a pancake landing on a child’s head. Inspired by the incident he tells them a story that night about the land of Chewandswallow. In that land, nobody has to cook their own food. 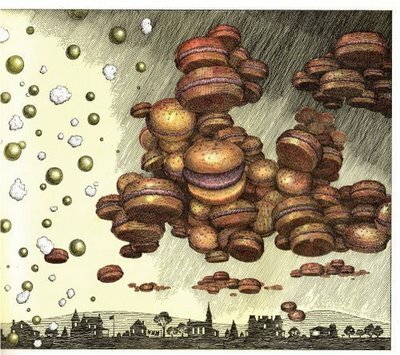 Instead, the food comes in in the weather systems. It might rain orange juice in the morning, mashed potato clouds might roll in for lunch and a roast beef front may come through in the evening. All is well and good until the weather starts to go haywire. Overcooked broccoli three days in a row. Giant doughnuts rolling down Main Street. Apparently that’s a problem but I don’t see why. It’s a fun, creative and unusual book from the author/illustrator couple who also brought us Animals Should Definitely Not Wear Clothing (which is also great fun). Now go, read, and dream of hamburgers raining down.